The Philly Cheesesteak is a civic icon, tourist draw and cultural obsession! You could easily make a mess of things when ordering the city of brotherly love’s most treasured food. So if you don’t want to be a total tourist about it heed the advice of the locals in these two videos sent to us by VISIT PHILADELPHIA® and UWISHUKNEWPHILADELPHIA Learn the art and lingo before you get in line for this flavorful sandwich in four simple steps. The easy part: eat and enjoy. Ordering a Philly Cheesesteak is serious business. Know what you want before you get to the counter and be quick about it! Cheez Whiz with fried onions–that’s a Whiz With. Provolone without fried onions ask for a Provolone Without. Cosmi’s Deli is a relative newcomer among the cheesesteak contenders, winning recent accolades from Philadelphia magazine. It may be across the street from the oldest cheesesteak joint in town, but Geno’s Steaks is a formidable competitor going roll for roll with Pat’s for nearly five decades. The brisket cheesesteak at Jake’s Sandwich Board can be adorned with either mild provolone and caramelized onions or, less conventionally, wasabi spread and crunchy onions. Jim’s Steaks has multiple locations, but the classic smell of fried onions wafting from 400 South Street makes that outpost a memorable one. A small shack amidst shopping plazas, John’s Roast Pork is frequently cited as one of the city’s top steak spots. Its secret weapon? A crusty seeded roll. The original home of the cheesesteak, Pat’s King of Steaks is still owned and operated by the Olivieri family. With rolls from Conshohocken bakery, a plethora of cheese choices and daily-cut sirloin, Spot Burger’s food cart has been repeatedly named a favorite among cheesesteak lovers. Locations vary. You can also order online at Grubhub. 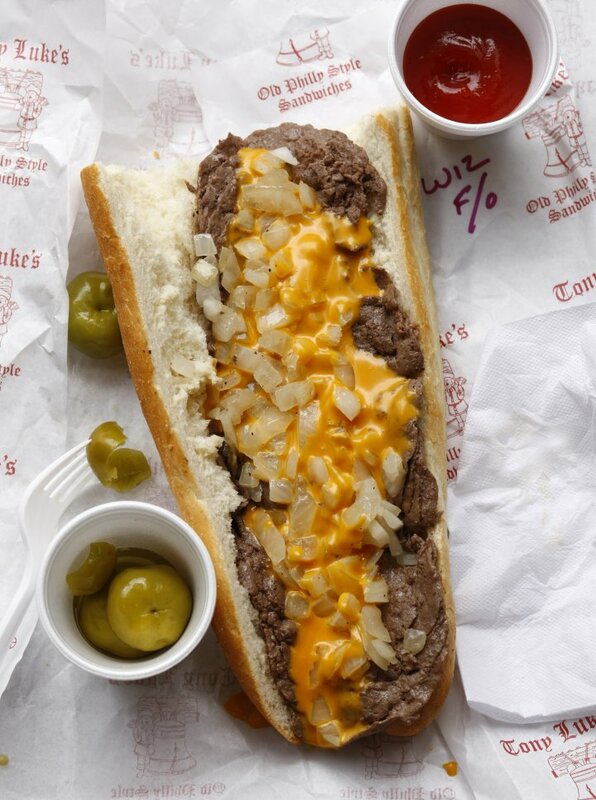 Every sandwich at the award-winning Tony Luke’s is worth ordering, and the deliciousness now spans multiple locations across state lines.